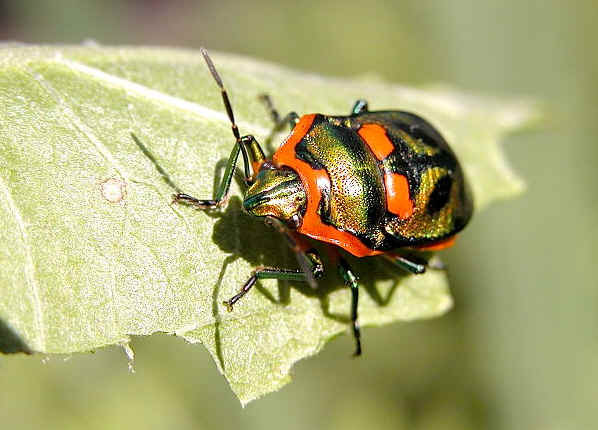 This page contains pictures and information about Metallic Jewel Bugs that we found in the Brisbane area, Queensland, Australia. 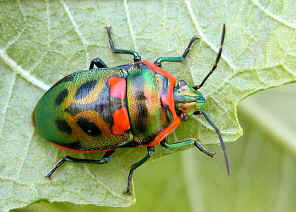 They are also known as Metallic Shield Bugs. 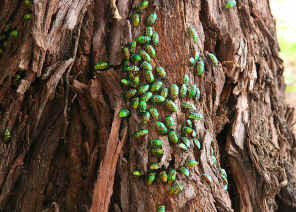 Metallic Jewel Bugs can be found on leaf letter or under bark. 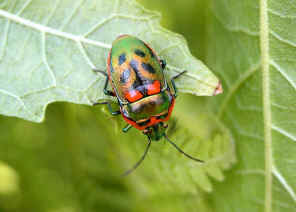 They feed on vegetable, garden plants, trees and fruits. The bugs are metallic green in colour with orange and black patterns on the back. 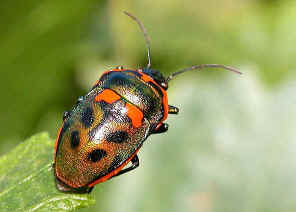 Underside of their body is bright red and black in colours. 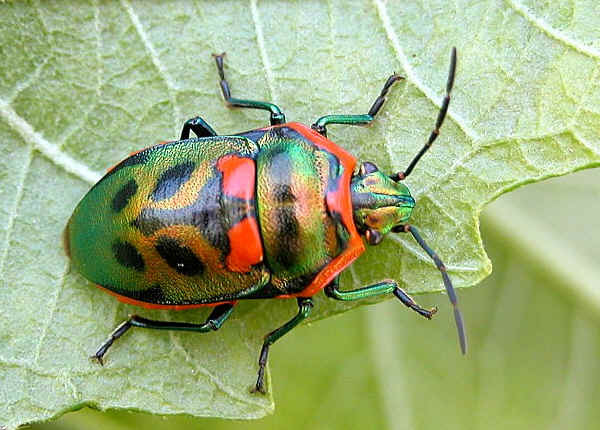 This bug is in the Shield-backed bug family. 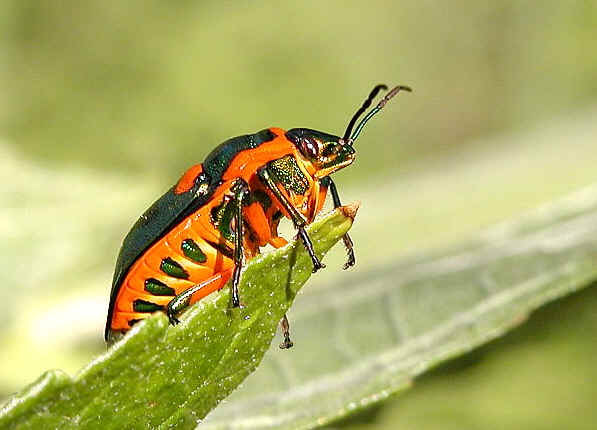 Shield-backed bugs are plant suckers. They can be distinguished from other shield bugs by their scutellum completely covered the whole abdomen and wings. This is why sometimes they are miss-recognized as beetle. They are easily distinguished from beetles by having sucking mouthparts and the shield on the back is continuous, not the divided wings cover with separation at the middle. Those pictures are taken in Yugarapul Park on Oct 2004. 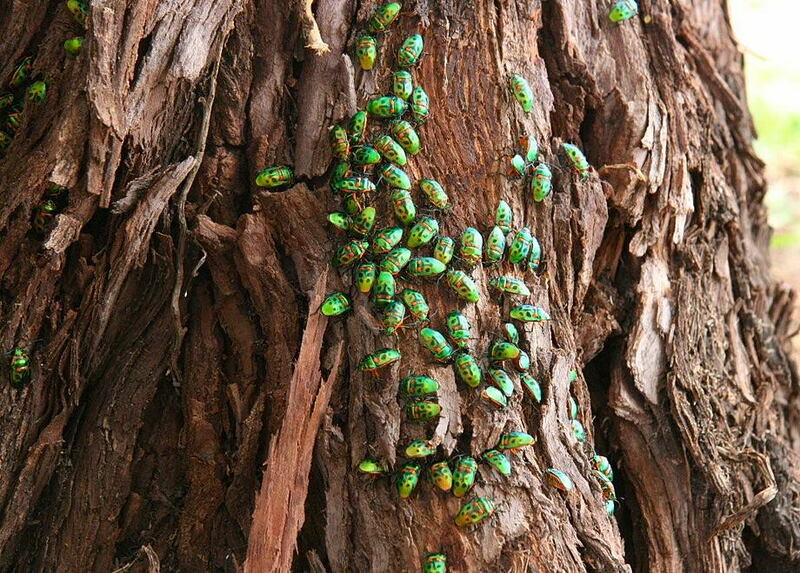 On mid summer Dec 2008, Tracey in Sydney sent us the above photos and concerned about so many of those bugs on exposed roots and trunk of tree in her backyard. We know that for some insects, includes some shield bugs, females use Pheromone to attract males. 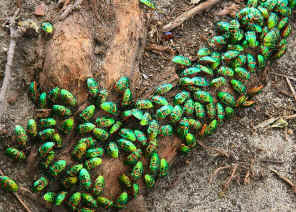 Sometimes a number of males detect the smell of females and gather together around them. 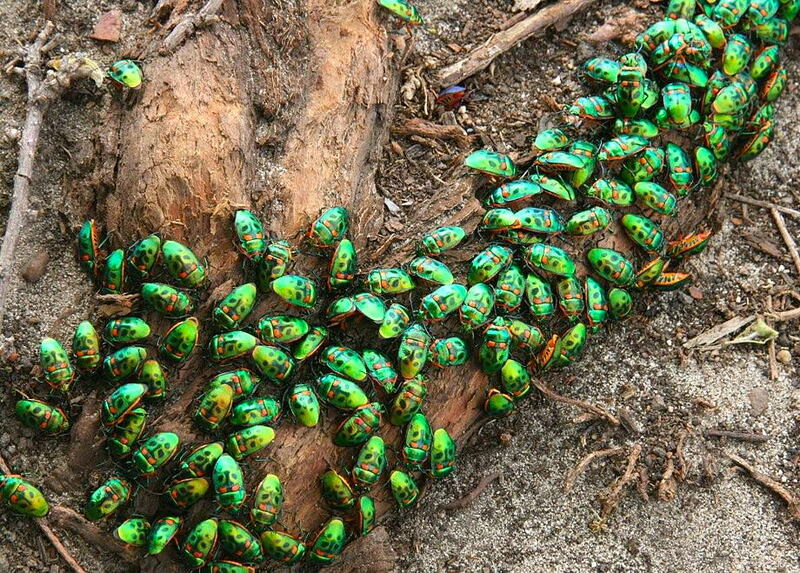 We never saw so many Metallic Jewel Bugs in one place and do not know why they were there. Please advise if you know the answer. 1. Insects of Australia, CSIRO, Division of Entomology, Melbourne University Press, 2nd Edition 1991, p 508, plate 3Q. 2. Insects of Australia, Hangay, George, & German, Pavel, Reed New Holland, Sydney, 2000, pp 65. 3. Scutiphora pedicellata - Australian Biological Resources Study, Department of the Environment and Heritage, Commonwealth of Australia 2005. 4. Revision of the Australian Scutelleridae Leach (Hemiptera) - FJD McDonald and G Cassis, Australian Journal of Zoology, 1984. Last updated: July 29, 2010.